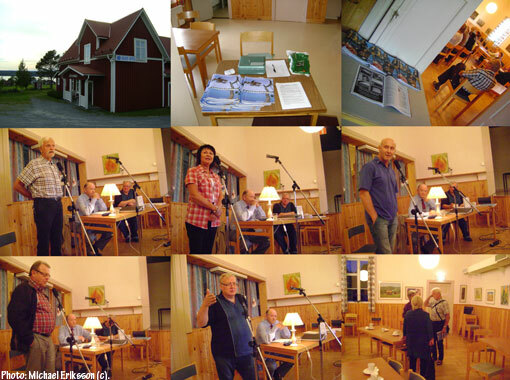 As mentioned yesterday on this blog, I would visit a Great Lake Monster meeting in Hara (a small village located by Lake Storsjön, The Great Lake) today and be part of yet another interesting evening listening to witnesses and talking about our world renowned mystery. 10 witnesses stood up and shared their personal experiences with the crowd and of these two or three were new – including a testimony from a gentleman that had kept his mouth shut since the end of WWII (he thought it happened in 1944 or 1945). The witnesses just told their story and left the rest up to the listener. That is the way it has to be, we just don´t know what this is all about as yet. Yes, we have a large unknown animal in this lake of some kind, but that is all we know at this point. There are theories based on key sightings but we just don´t know the answer. Visitors could pick up my publication “Storsjöodjuret” (“The Great Lake Monster”) from last year, as well as RETROFUTURE 6 (Purple edition). I enjoyed the evening and the company of these good people. Honest and down to earth all of them. I took some snapshots for my archive and you can see some of them here. These evenings are filmed and archived by the organisers. This is important work, but it is very low key at the moment. No media present as usual. Strange. I was also told that there will be a second meeting this year, on October 7 in a small town called Krokom. These meetings circle around the lake, allowing new witnesses to pop up every single time. It really is a job well done by the organisers (Föreningen Storsjöodjuret, roughly translates to Great Lake Monster Association). The archives are growing, the mystery is ongoing and it has got nothing to do with the tourist industry. They love to spin it, but they are not present on evenings like this. Still, the truth is out there.